Everything on this earth emits energy and dowsing rods have been used for millennia by people trying to tap into the energy emitted by certain objects. People would look for water using a “Y”-shaped stick with the “I” of the stick pointing in the direction they were walking. As they walked, the tip of the stick would start pointing down to a spot where the energy was the strongest and that is where they would dig. Todays’ dowsing rods are “L”-shaped but the premise is just the same, locating a strong energy field. 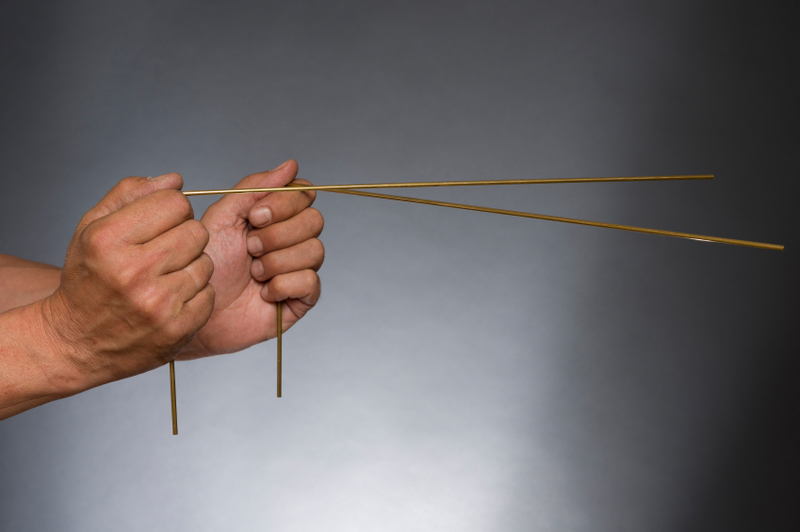 Before you start dowsing for spirits – Practice. Practice, practice, practice. Learn how your rods react to you and your questions. As you become attuned to your rods it is a good idea to keep them to yourself and not interfere with the shared energy by letting someone else use them. As the dowser, stand still, legs slightly apart, and with your arms held close to your sides holding your rods out in front you. Don’t tense up, be as relaxed as possible. Try and keep the sessions short, you will tire faster if you are tense. Close your eyes and take a few slow, deep breaths. Clear your mind. Just think of the questions and not what you think the answers may be. Now calibrate your rods by establishing “Yes” “No” responses. Once that is done you can start searching for a spirit. Watch your rods. As you walk around, and come upon a spirit, you will notice your rods moving and forming an “X”. This is the spot where a spirit’s energy may be the strongest. Drop one rod and ask permission to talk to them. If it’s ok your rods should react to your Yes/No position. If not, try other questions or another location. Once you locate a willing conversant, ask permission again and introduce yourself and the people from your group. Continue asking your questions according to the responses. Your rods may suddenly react differently to what you expect, ask the spirit if they are trying to tell you something or lead you somewhere. Try and interpret what they are telling you. Follow in the direction the rods are leading you to. If you feel you are lost or that the spirit has moved on, stop and try reconnecting again. You may come across the same spirit or even a new one.